What is Reverse Due Diligence? Due Diligence is often thought to be conducted by the potential Buyer of a business together with their accountant, solicitor, and other professionals. Sellers may wish to evaluate their own business, however, before listing it for sale, to gain a critical insight into their business through the eyes of a Buyer, and then make any needed changes that could enhance the value of the business. Reverse Due Diligence creates an opportunity for the Seller to objectively analyze the condition of their business, mitigate and avoid potential problems that may delay the sale, or even lose the Buyer. This is an opportunity to use your accountant to conduct a due diligence on your business, in the same manner that a prudent Buyer would do. This will reduce hidden surprises, which you can then work to eliminate, and may possibly shed light on hidden value, that can make the business purchase more enticing to a prospective Buyer and increase the sale amount achieved by the seller. The best-case scenario is to resolve any issues that need attention prior to listing the business for sale to achieve the best sales price possible, and to make the journey to conclusion as speedy and as less stressful as possible. Advantages of a Reverse Due Diligence. Even if all the issues may not be resolved, presenting a Buyer with a plan of action to rectify these issues, could increase the Seller’s believability and improve the chances of a sale. Once a Buyer has signed a Confidentiality Agreement (CA) and is seriously interested in buying the Sellers business, providing the buyer with a copy of the Sellers Due Diligence Report, means that you can avoid the “cross-you-fingers-and-toes” that the buyer doesn’t find hidden surprises. The Buyers Due Diligence then becomes more of an additional, but simpler exercise for the buyer. Reverse Due Diligence allows the Seller to look at their business through the eyes of a buyer. It can be a worthwhile investment, in that the Seller becomes more familiar with their own business, can answer questions with more authority, thus giving the Buyer more confidence in the purchase. 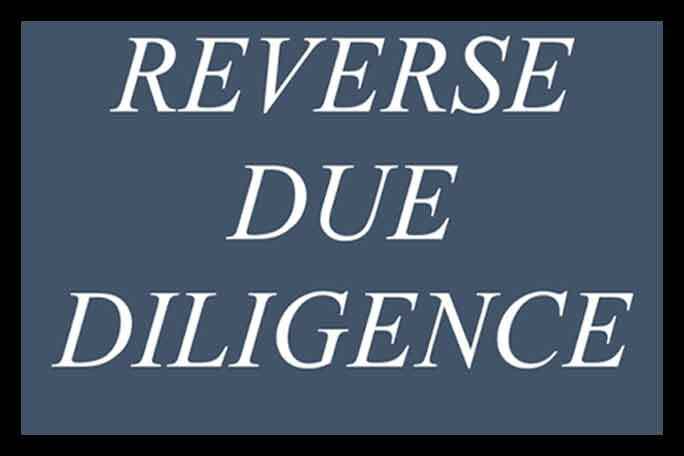 Reverse Due Diligence moves the Seller from a defensive position to a stronger bargaining position. The Buyer moves from a position of uncertainty to one of greater confidence in their investment. For both parties, the value of the business is enhanced, the uncertainty is reduced, and the transaction is concluded sooner.